Coverage: BBC Red Button, Radio 5 Live sports extra, BBC Sport website (Red Button coverage streamed on website throughout fortnight). Britain's Andy Murray saw his hopes of winning a first Grand Slam title at the Australian Open end with a five-set defeat by Fernando Verdasco. The Spaniard, ranked 15 in the world, prevailed 2-6 6-1 1-6 6-3 6-4 in the fourth round in Melbourne. Murray twice led by a set but could not find any consistency and in the end the power and aggression of Verdasco's game proved too much. Verdasco will play 2008 finalist Jo-Wilfried Tsonga in the last eight. On a hot afternoon in Melbourne, Murray produced a desperately uneven display that will be a major disappointment after his superb start to 2009. He got nowhere near the form that saw him beat the likes of Rafael Nadal and Roger Federer in an unbeaten start to the year. Having won all five of their previous encounters on tour, and in the form of his life, the Briton began as a strong favourite. And with the Spaniard seemingly reluctant to play his usual aggressive game in the early stages, Murray simply lured Verdasco into mistakes as he broke twice to take the opening set comfortably. But when Verdasco changed his approach in the second set, Murray was left floundering, and a succession of poor drop shots contributed to his downfall. A missed volley in game two handed Verdasco a break of serve and then he went 4-0 up after converting his sixth break point of an epic fourth game. Verdasco's heavy forehand was starting to fire and the passive rallying of the first set was no longer working for Murray, who was broken again as he dropped the second set. A lengthy struggle looked on the cards but Murray grabbed the initiative at the start of the third set and broke three times as he mixed up the pace more often. The fourth set proved to be a replica of the second, however, as Verdasco broke immediately and went through the set serving at an incredible 93% to force a decider. Murray earned the first break point in game six of a tense final set but Verdasco responded brilliantly with successive aces, and he held off another by dominating a magnificent rally with his forehand. Verdasco made the Scot pay by getting the crucial break in the very next game and he held his nerve impressively to serve out for victory in three hours and 12 minutes. 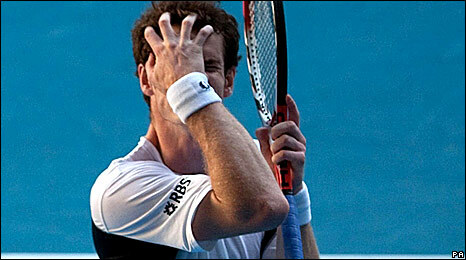 "I don't think it was anything to do with physical, concentration or my game," Murray said afterwards. "He played too good for me - that's what happens. I'm not here to try and make excuses for why I lost." He added: "I don't know what to say, the guy's a very, very good player. Sometimes they play better than you and he did today, unfortunately. "Last year I had a tough loss [against Tsonga in the first round], this year is obviously a tough loss as well. "I came back strongly last year and I plan to go and work on my game and hopefully get better."